Fox News is under fire for a Friday ad that inaccurately accused its competitors, including CNN, of failing to cover last weekend's Tea Party protests in Washington. WASHINGTON (CNN) - Fox News is under fire for a newspaper ad they purchased Friday that inaccurately accused its competitors, including CNN, of failing to cover last weekend's Tea Party protests in Washington. "How did, ABC, CBS, NBC, MSNBC, and CNN miss this story?" Fox's newspaper ad asks. CNN provided live coverage of the rally in Washington on Saturday, dispatching more than a dozen personnel, including multiple camera crews and the CNN Express Bus, to cover the event. Deputy Political Director Paul Steinhauser was live at Freedom Plaza; Correspondent Kate Bolduan reported live from the Capitol and throughout the crowd; All Platform Journalist Jim Spellman provided live hits all day after traveling for weeks on the Tea Party Express Bus; and CNN Correspondent Lisa Desjardins was live for CNN and CNN Radio from the National Mall. CNN's coverage also included numerous live reports and interviews with protesters and newsmakers, including rally day speaker Sen. Jim DeMint and activist Art Gerhart, who was on the set with anchor Don Lemon to discuss the event. In addition, CNN.com provided a live stream of the rally throughout the day. ABC referred Friday to a statement by Matt Kibbe, president of FreedomWorks - the group that organized the event – characterizing the network's coverage that day as "fair and honest." The rally story was featured on the network's morning shows, nightly news broadcast, in extensive radio reporting and online. MSNBC also pointed to its own reporting. "Just like every other network mentioned in the ad, MSNBC covered last Saturday's protest," the network said in a statement. CBS detailed its coverage of the event in a statement issued Friday afternoon. "CBS News had multiple crews on site with our Congressional Correspondent Nancy Cordes reporting," the network said in a statement. "It was the lead story on the CBS EVENING NEWS; CBS Radio News provided hourly reports during the day and CBSNews.com had the story in its rotating lead all day. They also processed the Nancy Cordes video and linked it throughout the site." And CNN criticized Fox for its inaccurate statement. "Fox News' ad released today is blatantly false regarding CNN's coverage of the 9/12 rally," CNN said in a statement. 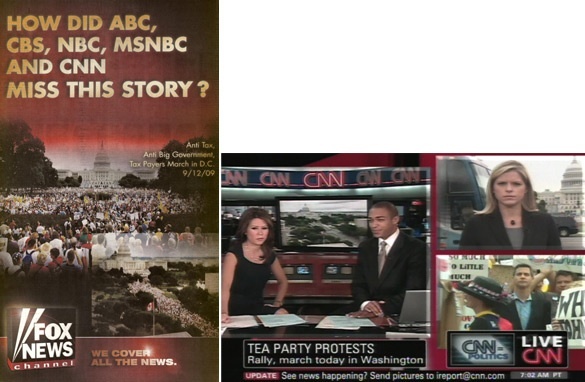 Watch some of CNN's Tea Party coverage here, and read some of our in-depth reporting. Q: If Fox is such a great news station, then why didn't they broadcast President Obama's speech to the joint session of Congress on health care reform? A: Because they knew if their viewers actually listened to the President, they'd figure out for themselves that Fox is lying to them when it tries to tell them Obama and his policies are to be feared and rejected out of hand. Fox estimated the crowds at the tea bagger rally in the millions; there were actually only a about 10,000-20,000. I have to partially agree with Fox on this one. Although I do not watch TV very much I was surprised that the CNN internet news coverage was basically nil or maybe I just missed it. Same can be said for the Acorn story this week which if it was Republican in nature would have been (and rightly so) plastered all over the news (Print, TV, and internet). You don't have to agree with the political leanings of the stories as most folks comment on this are on the liberal side of the fence. I understand that. But please be honest and face the fact that these were major news events that deserved more than what was covered by most networks. What needs to happen is more coverage in general. I don't care if it is Democratic or Republican in nature or what bias a network has. I am able to see through BS on both sides and make up my own opinion. Good or bad- Whatever happened to reporting? Do people actually consider Fox to be a real news channel? To me it's more like a bunch of grumpy white men stretching the truth and throwing tantrums! Im skeptical of any movement in which Glenn Beck is the central figure. The guys way over rated and an intellectual lightweight. Fox network is basically a Republican mouthpiece. And not even al of the Republicans. Only the most right wing neo-facists of that group. The way they report you would think that the world should be run only by rich, middle aged to very old white guys. And those guys would dole out whatever pittance they deemed fit to anyone who was not up to their status. Fox News lied......so what else is new ?????? Does anyone remember that it was Fox News that was still reporting that Michael Jackson had been taken to the hospital and was still alive almost half an hour after every single one of the other networks had already confirmed and reported that he was dead? Way to stay ahead of the curve, FOX. I will tell you this. Gloves are off. Everyone griping about the TRUTH of this article should be ASHAMED with the lies and mis-information that were being spread around over the last couple months. A strong majority of Glenn Beck followers are is wrinked and wacked out as that guy is. And I can't wait to hear the blitz from the Fringeright about the Obama's "Media Road Block" this Sunday. Watch for that term being hammered around from that those in a panic. Fox, this is a broken record with you. How dare you accuse the other networks of not reporting breaking stories. This is of great interest to me. I follow CNN because they seem to be more accurate in their reporting of events, they also offer a panel from both sides of the isle. Let's think back a few months ago when our President, Barack Obama visited Ghana, Africa, what a significant time in American history. The world was witness to how far we've come as a nation. President Barack Obama stood on the shores where many ancestors of now great Americans were taken from their homes and sent to an unknown world. This was a proud moment for all Americans, and the world. Fox News, you didn't cover it live as did all other networks. Please tell me it was more than just an over site. faux news whines again, what's new? They are building a strawman for the next event faux news orchestrates, every news channel will think they have to cover it 24/7 this is SOP for these folks. Oh BTW why did faux news not cover President Obama's speech? Had CNN,MSNBC done that to *W* publicans would have raised *ell! Boom! Roasted. (Unless a protest is massive, violent, or in some other way totally unique, it's not going to get a ton of coverage. This applies across the political spectrum.) Well-put, CNN! I rarely comment on stuff like this because it is such a waste of time, but here are my two cents: I like Fox for some of its content, and I like CNN for some of its content, as well as other networks. OF COURSE THEY ALL HAVE A POLITICAL BIAS. Everything is biased. Including liberal media. It is not news that Fox is leaning to the right. A lot of people criticize Fox for their spin, but while I read through the bias, I do respect that they are one of the only networks to take a conservative view. Its all marketing – in case you haven't realized, we live in a country that RE-ELECTED George W. Bush. Makes sense that someone would cater to that half of the country and make money off of them. If you really hate Fox, then stop complaining about them, because guess what they just got: A free ad on CNN. For a false ad about CNN. Ironic? Come on people. I am stunned reading these comments. The gathering in DC was all about having less government...getting the government out of our lives. Evidently, the vast majority of posters here want the government to make more of their decisions for them, take more of their money in taxes because obviously the government knows how to spend your money better than you do. How do any of u even call yourselves Americans? Do you even know how or more important why this country was founded? I've heard my friends refer to CNN as liberal, left leaning, the voice of socialism etc. and now after reading all these posts...I fear my friends are correct. You people need to move to Cuba or Venezuela for a year or two to see how great our country could be run under your vision. Faux has been blacklisted off my tv for over a year now. It's about time CNN woke up to the truth. You should try living in a red state (Oklahoma) where all the local news is biased. I watched one of Obama's speeches before the election and then watched them lie about the content on the local news. I was disgusted. I quit watching local news, especially when they were hiding cases of H1N1. Talk about propaganda. FOX is NOT a news organization, it's a distributor of PROPAGANDA. As far as their regular viewers, all I can say is "the Lowest Common Denominator." CNN news is fair and balanced? Right. Viewers of CNN like left spin on the curveballs ALL of the mass media throws at the public. According to these blogs, ratings are declining because people can't handle the truth? It's more like we can't get the truth. Barjack, this isn't "spin", this is an outright lie. It didn't say, "Why did these other networks not cover this as much? ", it said, "How did these other networks MISS this story?" This case is not a matter of perspective but something objectively provable of being FALSE.